Among the enduring memories of my time as an analyst at Mercantile Mutual Investment Management in the early 1990’s was the importance the equities team placed on active positioning in small company stocks. The firm built an enviable reputation in the space and were richly rewarded through strong fund performance over many years. I guess this is where my belief in small cap investing was shaped. Small companies or small caps, are those stocks that reside outside the 100 largest listed companies or the S&P/ASX100. Today they speak for ~9.5% of the Australian sharemarket up from ~ 6% not so many years ago. Names such as Nick Scali, Bega Cheese, Reece and Elders are examples of small companies that will be instantly familiar to readers. Since March 2017, small caps have been on a tear, handsomely outpacing the top 100 (+20.8% v +9.2% on an accumulation basis) as risk-seeking investors pursue exposure to improving economic conditions here and abroad. The question specialist managers like us get asked regularly is whether this strong outperformance can continue. Evidence is mounting that it can. Valuation is often where the discussion begins and ends. Small caps, as a collective, currently trade on a PE of 18x versus the S&P/ASX100 at 16x, pitching the sector at a12% premium. The chart above depicts the relative PE positioning of the 2 PE ratio’s going back to 1994. It highlights that small caps attract investors as the discount to big caps diminishes rather than the contrary. This outperformance can continue for extended periods of time. Eg Jan 2003-June 2007. Professional investors have traditionally demanded a 10-15% discount before investing- a penalty allegedly levied on small caps for illiquidity and information bias (favouring big companies). This is at odds with most major offshore stockmarkets where small/mid cap indices attract permanent PE premiums over big caps given their dynamism and superior earnings momentum. Why should we be any different? 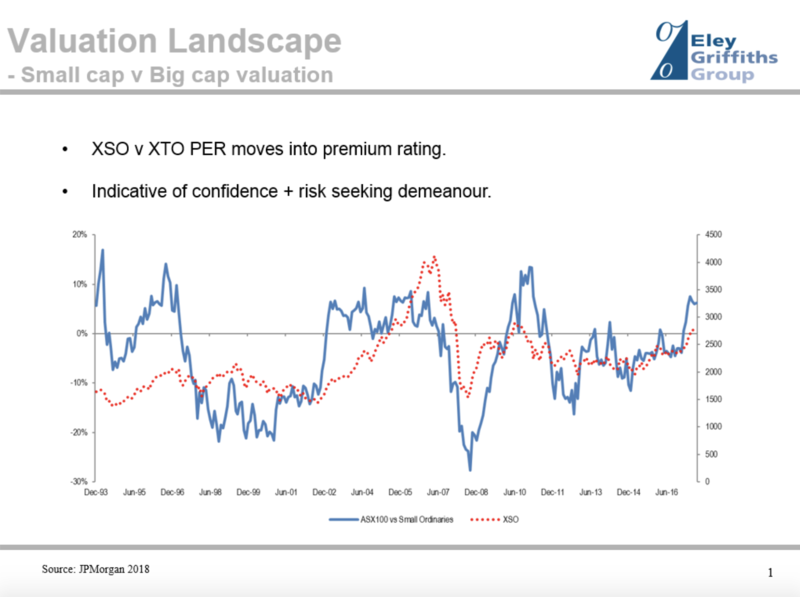 Premium PE ratings flag investor confidence and, generally, confirm a constructive equity market is in place. From time to time irrational pricing visits the market and it is during these episodes that investors might elect to monetise excessively rated stocks. Small companies tend to be highly cyclical in nature and therefore their fortunes are directly linked to macroeconomic swings. The Small Ordinaries Index is replete with cyclical exposures with resources, mining services, agricultural and consumer discretionary businesses and very few financial and utility counters. By comparison, cynics have labeled the ASX100 benchmark as ‘structurally challenged’, with around 40% comprising defensive/financial stocks ie essentially the major banks. A recent OECD report card for the Australian economy should have small cap investors salivating. The group lifted its growth estimates for Australia and international economies as stronger commodity prices, improving terms of trade and a recovering job market stimulate already supportive business conditions. Further, investment in mining and non-mining sectors, including infrastructure, is underwriting a broad-based industrial revival. Housing appears set to trundle through rather than fall away anytime soon. This is manna for Australian small companies. The small cap market is a seedbed for corporate actions. The bulk of Australia’s merger and acquisition activity occurs in this part of the market. In the past it has not been out of the ordinary to see over 50 takeovers in any given year. This brings on ‘nearology’ effects (who will be next?) and necessitates capital recycling, both positive for the space. New floats and capital raisings are the domain of small companies. Small cap investors are regularly presented with a cross-section of new investment candidates of truly varying quality and sustainability. In recent years the IPO’s of Reliance Worldwide, Netwealth and Wagners provide examples of well aligned management running high quality, growth businesses that have found immediate acceptance with investors, including us. It is interesting to note that around 40% of todays top 100 companies began their journey as small companies at some point during my 25 year tenor as an equities manager. You will find no greater validation for small company investment than this. Investors with patient capital and a readiness to assume some risk in their portfolio’s have historically been rewarded from investment in listed small/emerging companies or specialist managed funds.